You are browsing the archive for Bowling Green High School. This is part of a series presented by Mrs. Angela Alexander Townsend – see the full list of her articles here. 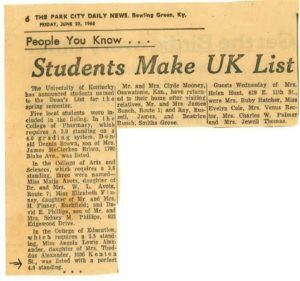 Attending the University of Kentucky at the time period in which I did was a genuinely exhilarating and profound experience for me. I remain forever grateful that I sensitively yielded to my mother’s strong, yet almost silent suggestion that I choose UK as a springboard to complete my higher education. My mother Thedders Alexander proved once again to be a smart woman, indeed. I must admit that recalling the trials and regular occurrences was sometimes painful, sometimes pleasant, sometimes laughable and even sometimes therapeutic, but I take unfathomable pleasure in knowing that with God’s help, I emerged as a survivor. In a less than ideal racial environment, one does not ever know just what s/he might be confronted with next. Even at the predominantly black college I attended, at some points I observed “carry over” prejudices among some faculty members and students.. That environment, too, was like “America’s Star Spangled Scramble” where everything and everybody is ranked, i.e. An A is not good enough unless it is an A+, etc. One female student complained that a male student did not know which fork to use first. Would-be-campus-Queens and their courts members were characterized and established by color, hair, and money. Many others were dogged by negative oral conversational comments and by notes of degradation scrawled underneath their yearbook pictures if they did not fit the ingrained American standards of beauty or success. A few Caucasian teachers imported from Vanderbilt or on loan from other colleges demonstrated overt instances of disdaining superiority. Now, be all of that as may, I thoroughly enjoyed the opportunity to share my part of the larger string of events during the early civil rights era and to be fortunate enough to share it multifacetedly. Indeed, being a UK graduate during that period and having it rounded out by what was missing at a different institution was almost a “study abroad” experience, one that has served me well at various times in life. Attending UK, the state flagship school known for its revered sports teams (heaven forbid though all white) and the fact that “I had endured through acceptance,” made me a rather respected anomaly back home. My now ex-husband, a sports enthusiast year around, observed that he didn’t personally know anybody who had gone to UK. Only half joking when I tell people that he dated me early on because I had gone to UK, and that he probably envisioned our ongoing return to sports events, especially the basketball ones, is that precisely, only half joke. Maybe not. (sm.) When he wasn’t at a game at WKU, his alma mater, he was at U of L, etc. and followed them on out-of town games. When he wasn’t physically present at a game, he was jumping up and down at one in front of the television. A year after I had been graduated and had tired of working for the government, I accepted employment from Bowling Green High School (BGHS), the largest high school in the city. BGHS was formerly all white a merely year two before and was under obligation to accept some of the black teachers from High Street High which was previously all black. As an outsider to that definition, I was hired. A few others at the black school were not. In addition, as the youngest and most inexperienced of all among both whites and blacks at BGHS, I was assigned to the “best” and highest level classes. 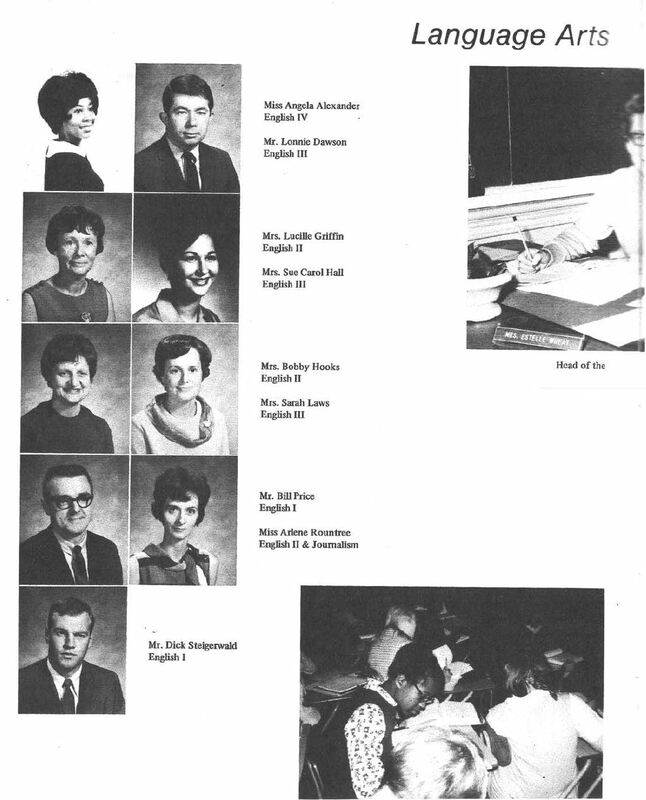 (See excerpt from the BGHS yearbook, the Beacon, to the right – click on the image to see a larger version.) I never realized the gravity of such things until years later. I was assigned to senior English and I do recall that it was “A” English as they were then labeled ABC etc.They did not use labels like college prep and Honors English until years later. I did not realize the competitiveness for senior English or Advanced English until I became Department head years later at Greenwood High. I attribute much of that assignment to having been graduated from UK. 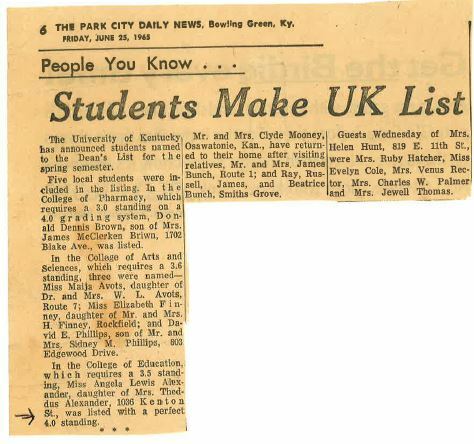 The summer before, UK had sent an article of Dean’ s listed graduates by name to the local newspaper, and I was the only one listed as having a “perfect 4.0” as they described it.